Someone sprung a leak! And it's still a bit difficult to tell where it came from. According to Julian Assange, (and the lawyers representing Wikileaks), it was a reporter working for The Guardian. The Guardian has denied all responsibility. The trouble, Wikileaks alleges, all started when The Guardian's, David Leigh, published a lengthy encryption key in the February 2011 publication Wikileaks: Inside Julian Assange's War on Secrecy. The key was given to Leigh by Assange so that he could access an online file containing more than 250,000 uncensored US State Department diplomatic cables. The point of contention could simply be miscommunication between Assange and Leigh. The Guardian claims both parties agreed the diplomatic cables would be available on an online server in July 2010 for a period of hours, after which, the files would be removed and the temporary server turned off. Assange denied this account in a recent interview with New Scientist, "The only thing that was temporary was the website location the file was stored in. But the password is not used for the website – it is used for decrypting the file." However, the plot seemingly thickens, as questions remain over where and when the first bittorrent leaks occurred and at what point Wikileaks became aware that the files had become public. The BBC bluntly stated, "It has long been known that Wikileaks lost control of the cables even before they were published and that encrypted files are circulating on the internet." The Guardian also claims that after the initial leaked file surfaced on bittorrent, "At about 11pm on Wednesday [Aug. 31] an anonymous Twitter user discovered the published password and opened a separate file – not the one shared with the Guardian – that had also been circulating on file-sharing networks for several months." What is clear is that at some point, the encrypted files containing the diplomatic cables had found their way onto bittorrent. However, writing for The Guardian, James Ball reports that the bittorrent file had not yet been discovered by the public: "By 10am on Thursday [Sept. 1] it had been accessed once in the previous 31 days, despite mounting speculation about its existence." It's nonsense to suggest the Guardian's WikiLeaks book has compromised security in any way. Our book about WikiLeaks was published last February. It contained a password, but no details of the location of the files, and we were told it was a temporary password which would expire and be deleted in a matter of hours. It was a meaningless piece of information to anyone except the person(s) who created the database. No concerns were expressed when the book was published and if anyone at WikiLeaks had thought this compromised security they have had seven months to remove the files. That they didn't do so clearly shows the problem was not caused by the Guardian's book. Two weeks ago, when it was discovered that information about the Leigh book had spread so much that it was about to be published in the German weekly Freitag, WikiLeaks took emergency action, asking the editor not allude to the Leigh book, and tasked its lawyers to demand those maliciously spreading its details about the Leigh book stop. WikiLeaks severed future projects with the Guardian in December last year after it was discovered that the Guardian was engaged in a conspiracy to publish the cables without the knowledge of WikiLeaks, seriously compromising the security of our people in the United States and an alleged source who was in pre-trial detention. Leigh, without any basis, and in a flagrant violation of journalistic ethics, named Bradley Manning as the Cablegate source in his book. David Leigh secretly passed the entire archive to Bill Keller of the New York Times, in September 2011, or before, knowingly destroying WikiLeaks plans to publish instead with the Washington Post & McClatchy. David Leigh and the Guardian have subsequently and repeatedly violated WikiLeaks security conditions, including our requirements that the unpublished cables be kept safe from state intelligence services by keeping them only on computers not connected to the internet. Ian Katz, Deputy Editor of the Guardian admitted in December 2010 meeting that this condition was not being followed by the Guardian. In the meantime, The Guardian, has responded by claiming that as recently as one month ago Assange had been in discussions with Editor-in-chief, Alan Rusbridger, about future projects. The Guardian has also implied that the leaked files may have originated from Wikileaks. Ball points out in his report that one of the encrypted BitTorrent files containing the cables had been leaked in December, just hours before Assange turned himself over to authorities in London. According to Ball, "In the days running up to his arrest, Assange had spoken of "taking precautions" in the event of anything untoward happening to him." So it seems we are back to square one, with Wikileaks and The Guardian blaming each other. While Wikileaks is blunt with its lawyered-up threats, the latter tacitly implies that Assange was behind the file leak. The row finally came to a head as Wikileaks swiftly published all 251,000 uncensored diplomatic cables online. 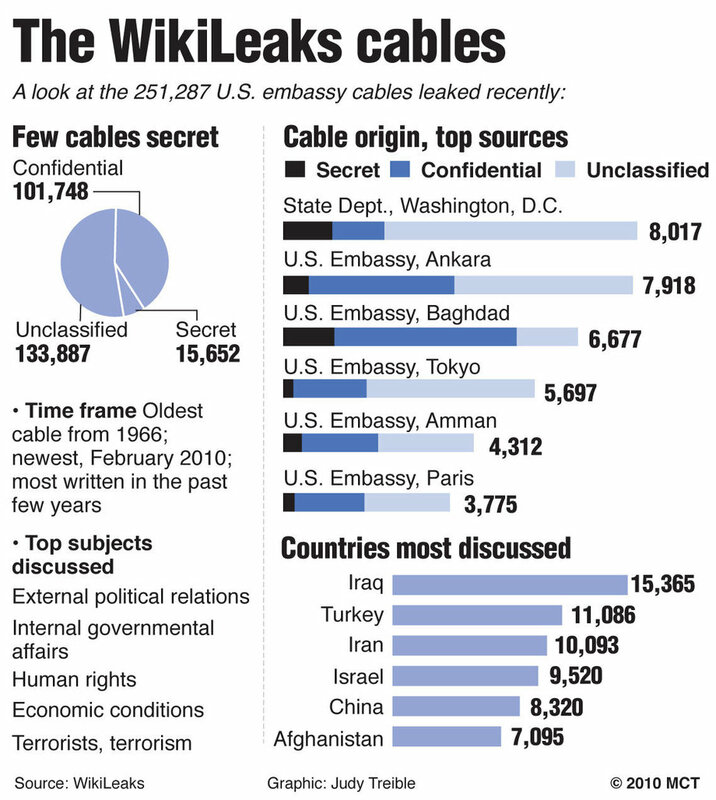 New Scientist's Paul Marks, makes the case for why Wikileaks was right to release the cables. The Independent's James Harkin says Assange is "deluded about power." At least one Indian politician believes Assange should be in an asylum. And Australia has decided, after widespread speculation, that it will not be prosecuting Assange. I owe a favor to whomever suggested that I take a look at this blog. As a former journalist/reporter/editor, I find it both thrilling and hopeful that such good (and I mean that in ethical as well as journalistic terms)work is being done by a young American in London. It shows an impressive degree of initiative and a like amount of good-heartedness. Bravo.